Loud Speakers : A loud Speaker is a device which is actuated by electrical energy and radiates acoustic energy. The selection and installation of a speaker as well as its design should be guided by the problem of coupling an electrical signal source as efficiently as possible to an acoustic load. This involves the determination of acoustic load or radiation impedance and selection of a diaphragm, and means of coupling the loaded loud speaker to an electrical signal source. The performance of the speaker is intimately dependent upon the nature of its acoustic load and should not be considered a part of it. The nature of the radiating system and therefore the acoustic load impedances it sees, is primarily determined by space, acoustical environment and cost factors. In other words, a loud speaker is an electro-acoustic transducer normally intended to radiate acoustic transducer normally intended to radiate acoustic power into the air so that it is effective at a distance. In order to accomplish this, the loud speaker must be designed in such a way that it will cause the varying electric currents to set in vibration a diaphragm. The vibration of the diaphragm in turn sets the surrounding air molecules into motion. The vibration of this comparatively large volume of air produces the sound, and received by the ear. The efficiency of a loud speaker is defined as the ratio of the useful acoustic power radiated, to the electrical power supplied to the load and is very low even in the most carefully designed systems (maximum of about 30 percent). 1. The driving unit or motor which changes the varying currents of the audio frequency amplifier into mechanical vibrations. 2. The other part is that which acts in conjunction with the driving unit to produce the vibration of the air molecules, and consists of a surface of various geometrical designs such as conical or flat shaped horns. The horn has been known and widely used for centuries for increasing the radiation from a second source. The most commonly used are conical and exponential types. The conical horn may be defined as one in which the cross-sectional area of the horn varies in direct proportion to its length, whereas in exponential form the area of the horn varies as an exponent of its length. In this type, the moving iron driving type is employed. The principle of operation is based on the varying of the magnetic polarity of the armature. These variations are caused by the electrical impulses flowing through the coil winding which encircles the armature. The movement to the armature is effected by the induced magnetism, causing it to oscillate between the two poles of the permanent magnet. 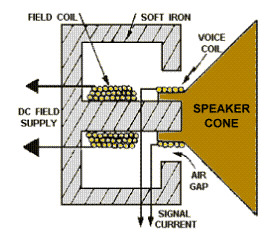 A speaker of this type consists, principally of a field coil, a voice coil and a cone. The field coil is connected to a dc source, effecting a strong magnetic field across an air gap in which the voice is inserted. The signal current from the output terminal of the receiver, flowing through the voice or moving coil placed around the middle pole of a three pole magnet, causes the voice coil to oscillate corresponding to the oscillations of the signal current. The diaphragm being mechanically connected with the voice coil oscillates in a similar manner. A wireless more details is space saver and you can get rid of all those wires and chords lying around the floor. You can also hide it anywhere you like. If you are concerned about the neatness and appearance of your room, you need to consider a wireless sub.